COLOR WATER IS A HEALTHY BOTTLE WATER DRINK. COLOR WATER IS HEALTHY, REFRESHING AND IS MUCH NEEDED AROUND THE WORLD (GLOBAL). 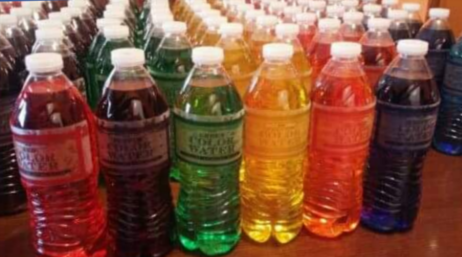 I CREATED COLOR WATER SO KIDS, ADULTS AND EVEN PETS CAN STAY HEALTHY, FIT AND TO PURPOSELY DRINK MORE WATER, TO CUT DOWN ON SUGARY DRINKS. COLOR WATER COMES IN A VARIETY OF COLORS, RED COLOR WATER, GREEN COLOR WATER, ORANGE COLOR WATER, BLUE COLOR WATER, YELLOW COLOR WATER, PURPLE COLOR WATER AND PINK COLOR WATER. PINK COLOR WATER WAS SPECIALLY DESIGNED FOR BREAST CANCER AWARENESS. NOT ONLY IS COLOR WATER VERY UNIQUE, IT ALSO GIVES THE ILLUSION THAT YOU'RE DRINKING SOMETHING OTHER THAN WATER. THERE'S NOTHING ELSE LIKE COLOR WATER IN THE WORLD. COLOR WATER IS THE NEW WAVE AND SOON WILL BE SOLD IN WATER PARKS, SPORTING EVENTS, GROCERY STORES AND MANY OTHER LOCATIONS. DRINK MORE WATER, SAVE MORE LIVES.